You'll love this lightweight Sports Chair with an embroidered back at shows and trials, or just hanging around the porch! 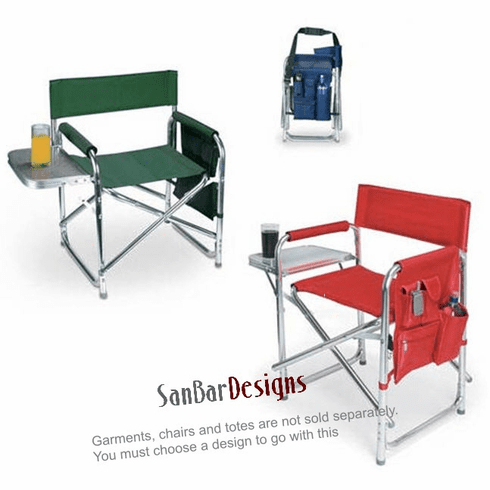 The chair includes a handy side table, a pouch for your cell phone, sunglasses, etc and a carrying strap. For the embroidery, we take the Chair Back apart, stitch out your design, and then sew it up so it's ready to use. Choose what you want it to say. You can have your dog's name, your name, your kennel name, or whatever you want. Final size of design will be 10.75" x 7" or smaller. This makes a great "High in Trial" gift or judges gift, too. If you have the chair already, you can buy the backrest separately.